Maximize our teachers’ personal involvement with each child by maintaining a teacher – child ratio lower than published requirements by the state. Provide opportunities for interacting with other children and developing social skills. Encourage safe appropriate play that contributes to the developmental needs of the child. Provide opportunities for meaningful play that will help empower the child to explore their abilities to communicate, investigate their environment, and express themselves. 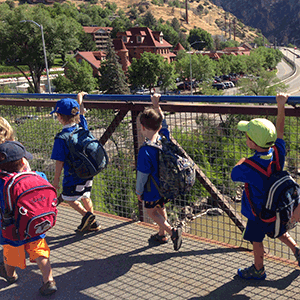 Cultivate an appreciation of the natural treasures of the Roaring Fork Valley with local field trips and by inviting local organizations to visit our school. Children will be cared for in safe, nurturing environment by a professional, compassionate, staff. We will be available to meet with parents regarding their child’s growth and development. Support “commuting hours” often necessary for parents in the valley by being open from 7:30am – 5:30pm. Foster a family atmosphere by joining together for community picnics, carnivals, and local events. Participate and involve families in local events. Enhance the value of the surrounding communities by providing a high-quality childcare and preschool. Contribute to the growth and development of the future citizens of the community. Blue Lake Preschool is licensed by the State of Colorado. We are inspected regularly to ensure that we meet or exceed health, safety, and other state requirements. Blue Lake Preschool is an equal opportunity provider. We accept applications for admission and employment without regard to race, religion, gender, national origin, color, creed, physical or mental disability, sexual preference, or any other protected status.